Keywords: infant formula, breast milk, spray drying, optimal drying conditions, A2 β-casein. In this work, an infant formula enriched in α-lactalbumin and whose β-casein fraction contains only A2 β-casein was development by spray drying. Experimental infant formula (EF) was designed to closely resemble the protein composition of human milk. Response surface method (RSM) with two factors: total solids and inlet air temperature was used for the optimization of the spray drying process. Response variables were solubility, moisture content, luminance and peroxide value. To define optimal drying conditions, a stability test was performed for two treatments (120 °C, 40 wt. % and 170 °C, 30 wt. %), which were obtained from the RSM. The treatment with 170 °C and 30 wt. % concentration of total solids was selected as the best alternative for the spray drying process. The protein composition in the EF was 37.1% casein, 23.1% α-lactalbumin and 21.3% β-lactoglobulin. A decrease of 6 % in β-lactoglobulin increased the relative proportion of α-lactalbumin, which favoured the similarity of the EF to breast milk. 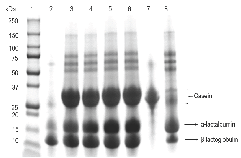 The homology of the β-caseins with the A2 β-casein isoform was 99.82%.